‘As you are aware, we have been working with the lenders to secure interim funding for our operations. The interim funding has not been forthcoming thus far...’ he wrote. Dube added that the board of Jet would meet on Tuesday to discuss ‘the next steps forward’. 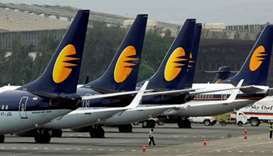 The State Bank of India-led lenders took control of Jet last month, pledging to give $218 million of ‘immediate funding support’ as part of a debt resolution plan. SBI said in a statement that ‘necessary support to facilitate the (debt resolution) process is being extended by the banks in the consortium’. ‘Cooperation by and support from all the other stakeholders will be the key to the success of the process,’ it added.